It was the first leg of my cooking demo and this time, we went down south. Together with my ever-supportive mom, sister and fiance, we made sure to reach Parañaque by lunch as we have been hearing a lot of wonderful raves about the different restaurants located particularly along Aguirre Avenue inside BF Homes. Our chosen food stop was at Chi's Brick Oven Kitchen. I've been wanting to try this restaurant and boy was I excited! Entering the cozy looking restaurant, I scanned a couple of clippings that were displayed on the wall. I took note of the recommended dishes and sat down to order. I liked the sunny interiors of the restaurant and the smokey smell coming from the huge brick oven located up front. First choice was the Wood-fired Buffalo Wings (Php. 190) for starters. It's actually the first time that I've tried a non-greasy buffalo wings and the healthy feel actually gave a good start to our meal. 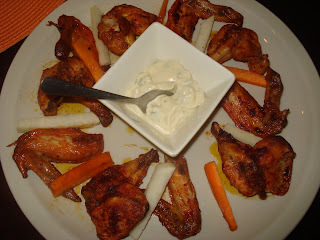 I love the bleu cheese dressing that came with the wings. It would have been better though if the wings were bigger in size. Our next choice was the Puchon (Php. 345). This is actually lechon (roasted pig) baked in pugon (brick oven). My mom, who's really a very healthy eater surprisingly gave us her thumbs up sign. It's actually the first time I've seen Mommy approve of lechon! I guess it's because the fat is very thin and the lean meat was very tender. 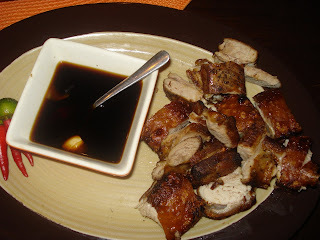 This is perfect for those who would still like a taste of lechon minus the cholesterol. It also seems like Paul and my sister enjoyed this dish too. Finally, the star of our lunch -- the Pizza Mediterrano (Php. 360). 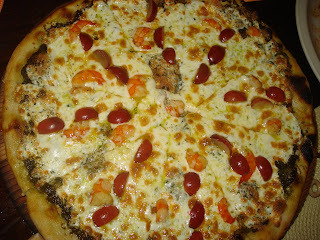 This 12 inch pizza is topped with pesto, feta cheese, shrimps and grapes! I love the fact that its crust is very thin and the flavor was just perfect. I am a huge fan of feta cheese that this was my only request when Mommy and Steph were choosing which pizza to order. The grapes gave a good touch to the pizza as it reminded me of my favorite Greek salad. No wonder Chi's Brick Oven Kitchen has been garnering raves all over town. We enjoyed every single thing that we ordered and were actually planning on what to order on our next visit. I love the smokey taste that we get from each dish baked in the brick oven. Despite the long travel, this pizza place is definitely worth a try! 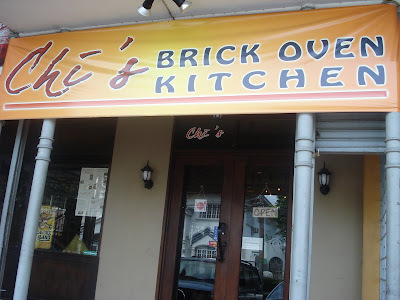 Chi's Brick Oven Kitchen is located at 209 Aguirre Ave., B.F. Homes, Paranaque City, Philippines. Call them at 8207210, 09178971117, 09179260555. Brickoven pizza taste so good! :) Can't wait to go back!